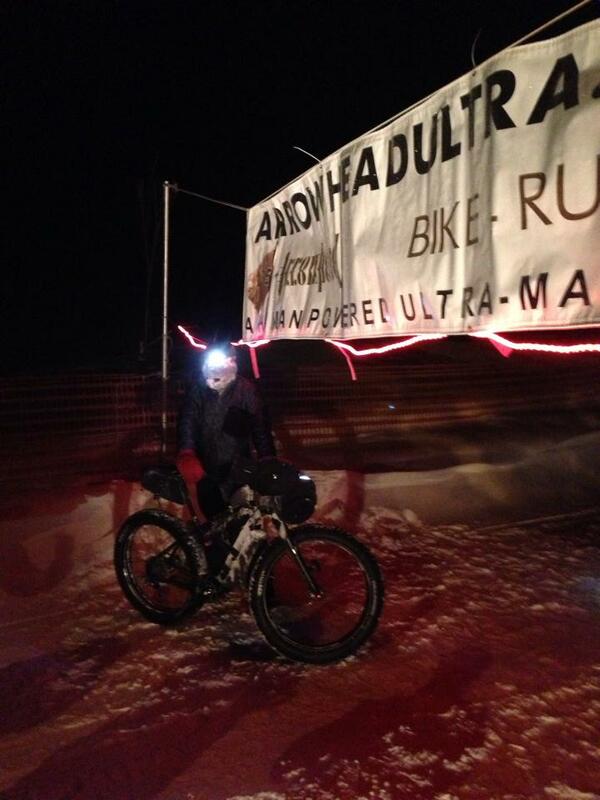 Jay Petervary at the finish of the 135-mile race across Northern Minnesota. Photo by Arrowhead 135. Amid a polar vortex that held temperatures into the deep minus teens and twenties, Idaho endurance cyclist Jay Petervary and his wife, Tracy Petervary, won the Arrowhead 135, a 135-mile race across northern Minnesota on the snowbound Arrowhead Trail. 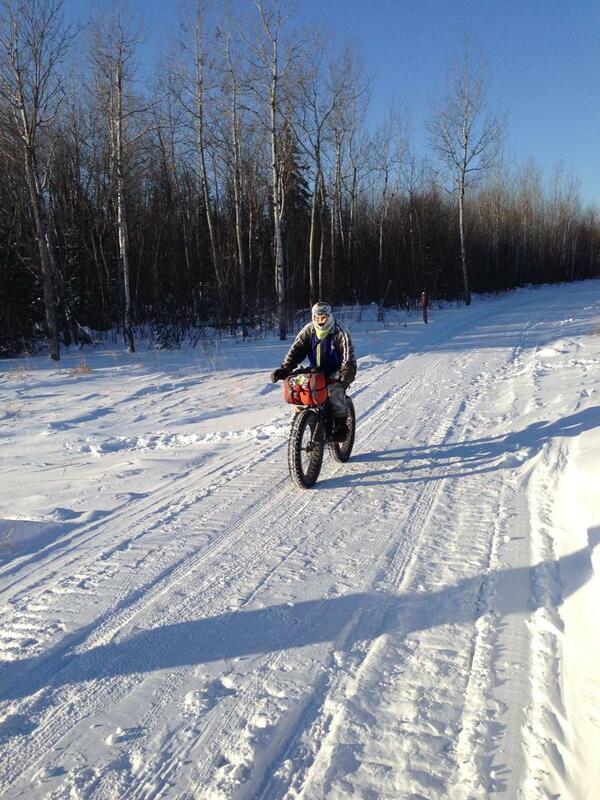 Jay’s time of 20 hours and 11 minutes was nearly six hours off record pace, and he was forced to push his bike a short distance into the finish after his bike’s freehub froze in the subzero cold. Tracy won the women’s bike race in 27 hours and 22 minutes and was fifth overall. Both Petervarys are experienced winter cyclists, having both completed and won the Iditarod Trail Invitational 1,000-mile race to Nome, twice. A cyclist rides near the start of the Arrowhead 135. 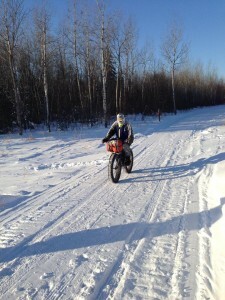 Current record holder, 2013 winner Todd McFadden, scratched at the first checkpoint with frostbite. A number of racers were pulled due to frostbite damage on their faces and feet, mechanicals caused by the cold, or simply because they were not fully prepared or comfortable with long exposure to the low temperatures, with windchills dipping to 40 below. Although the Arrowhead 135 takes place in “The Icebox of the Nation” and is well-known for Arctic cold, the past few years of the race have been comparatively mild. 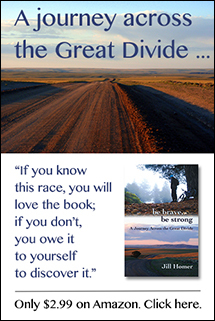 Race director Jackie Krueger expected this year’s finish rate to be lower than 30 percent. 141 cyclists, runners, and skiers started the race, and as of the 30-hour mark, about half had scratched. The race has a 60-hour cutoff. For photos of the Arrowhead 135 from MPR News, visit this link. Race updates are posted here.